In the Bark or Not debate this Diagram shows the two key elements of the tree that can effect your Barbecue results. 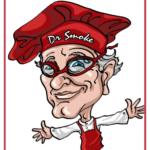 Smokinlicious® only harvest wood from the heartwood of the tree. This Diagram shows the two key elements of the tree that can affect your Barbecue results. Smokinlicious® only harvests wood from the heartwood of the tree. 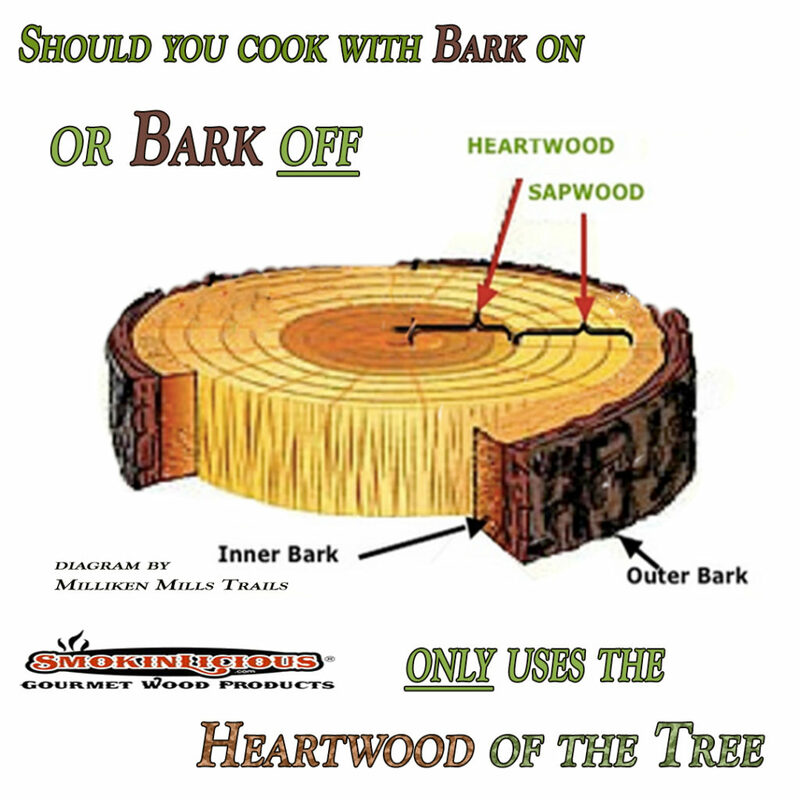 Should I cook with bark on woods or go bark-free? I’ve heard all kinds of reasoning for leaving the bark on: it burns up right away so you don’t need to worry. It’s what gives the flavor to foods. It’s what gives the color to smoked and grilled foods. It is the essence of BBQ! Well, my intention is to simply provide you with more detail about what is in the bark and then you can decide for yourself if you want to include it in your wood-fired cooking method. There are two types of bark in every tree: living bark which is called phloem and dead bark called rhytidome. For today’s discussion, I am only focusing on the rhytidome or dead bark which is the outer bark layer. Outer bark’s main purpose is to protect the wood tissues against mechanical damage and preserve the wood tissues from temperature and humidity variations. Bark chemistry is much more complicated than wood tissue chemistry but let’s cover the basics. For many years, university and research facilities around the world have used tree bark as a bioindicator of air pollutant levels as the bark is highly porous, rough, and high in lipids making its surface ideal for absorption. It’s been proven that tree bark soaks up airborne gases and particles. In fact, in my own home state of New York, the Niagara Falls area trees have been noted to have significantly higher levels of Dechlorane Plus, a flame retardant chemical that is produced by a factory in that city. How much higher? Several thousand times higher! After many decades of non-regulated chemical use in various products – think pesticides, flame retardants, building material preservatives, etc. – and with the subsequent halting of production of many of these highly toxic chemicals in the 1980s and 90s, research now shows that as those chemicals evaporated, they became airborne particles. Those particles landed and were absorbed by the outer tree bark. My experience with bark-on woods used for the intended purpose of cooking has been that bark results in temperature control issues. Often, when the bark combusts it does so in variable levels, producing a short burst of elevated temperature. This is likely due in part, to the chemical air pollutant particles that have settled into the outer bark layer. Knowing that bark harbors impurities that the tree is exposed to, I hypothesize that there likely are other particles, likely transferred via air as well as direct contact from the carrier (think animals, humans, etc. ), that are absorbed by the tree’s bark. Just as lighter fluid can add unpleasant or at the very least a distinct taste difference in foods cooked over product lit with lighter fluid, I caution that some of you will also find an off taste to foods cooked over bark-on woods. If you are lucky enough to have a source of wood within your own property, that has no neighborly contact with chemical industry, and you feel confident that the bark-on wood is safe, then the choice to cook with it may be easy.